What did Warren Buffett say was the most important rule of investment? “Never Lose Money”. Now, Warren probably uttered this phrase with his trademark wry grin. It sounds simple, but if it were that easy to “never lose money” everyone would be rich, or at least no one would be poor. This is clearly an adage that most people do not follow or master. So how can we learn to hold tight to the money we have? One key is definitely to look at every bit of money you spend as an investment. This is especially important for major purchases like your car, your home, even your bicycle. Before you buy, it is important to understand your goals for this item. How long do you want it to last? How often do you plan to use it? Can you maintain it or do you have to pay someone else to do so? For many years our friend Mr. Buffett drove a 2001 Lincoln Towncar, before selling it on Ebay for $70,000+. You may not be able to pull off that last miracle, but the event contains a lesson that all smart people should apply to their money. Say you’re the one with the 2001 Lincoln. It has been your tried-and-true mode of conveyance for more than a decade. Now that it’s time to sell, how do you get the most for your investment? You could just throw it on Criagslist and hope for the best, but that’s not what Warren would do, and that’s not what you should do either. Compare its Value is one of a few services that can tell you exactly how much your car is worth. This information is valuable in many ways, chief of which is this: it can help you make sure no one price-gouges you. If you come to find out that your Lincoln is worth $4000, you can make sure that your dealer gives you exactly that in trade, or your individual buyer doesn’t drive away with your car for a dollar less. How are these valuations ascertained? This is a little more complex than the old Blue Book. Today, with the proliferation of used car and sales data, we know exactly how much 2001 Lincoln Towncars go for, in all their various states of wear, all over the world. To get the amount that you should ask for your car, you’ll input your car’s mileage, condition, and any extra features that make your Lincoln better than a standard-issue Lincoln. These factors, weighed against an international history of sales of similar vehicles, will give you a very specific dollar amount that you should expect to receive for you car. This is the best option for you, unless you’re Warren Buffett or someone of that ilk, in which case Ebay may be the path for you. Another way to maximize your profit in the sale of your old car is to advertise it well. Even if you are limiting yourself to potential buyers in your small town, take the time to make a great ad. This typically consists of good pictures and thoughtful writing about the particulars of your vehicle. Does it pass inspection? Is the upholstery clearly visible and clean in your photos? Have you addressed most of the questions that people ask when they go to buy a used car? You’d be surprised about how many people really have something to sell, but fail to do so or don’t do so for very much, because they scrimp on the photos and the ad space. 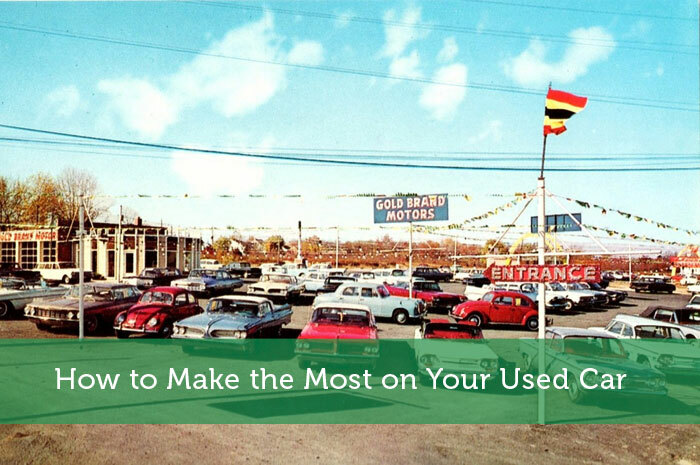 It should go without saying that you’ll get more for your used car if you’ve taken good care of it. If you get to the end of its life in your driveway, and it is poorly maintained and odious to the eye, you’ll be lucky to sell for more than its worth as scrap. If it runs well and looks good, you will maximize your sale on your investment. Selling a used car for a tidy sum is a great way to apply Warren Buffett’s rule of “never lose money”. You may not have the celebrity status to replicate his Ebay stunt, but even selling your 13 year old vehicle for a few thousand dollars makes your ownership of the car worth it. After all, you’ve spent more than a decade getting reliable use out of this vehicle. To recover even a fraction of your original investment on a car kept for that long is a bonus more careless owners do not receive. Very timely article for me as I’m looking to unload my car in the next few days. I will check out the car valuation website for sure.